The Oregon Community Foundation has funded early childhood scholarships at Portland State University's Center for Career Development in Childhood Care and Education (OCCD) since 2002. 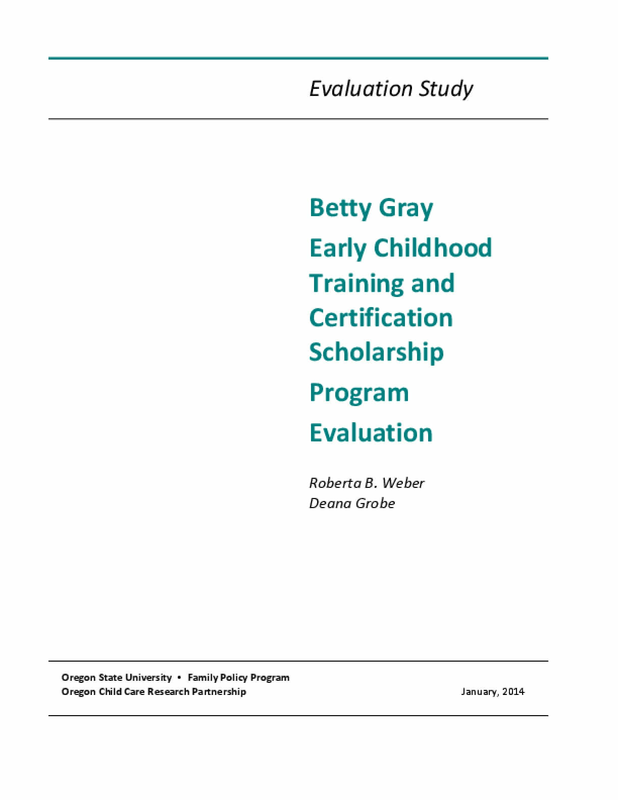 In 2003, the Betty Gray Early Childhood Training and Certification (BGECTC) Scholarship Program was launched, building on the previous program. The Oregon Community Foundation posed the following questions in its request for the evaluation of the BGECTC Scholarship Program: 1. What are the characteristics of scholarship recipients and the populations they are serving? 2. How do scholarship recipients compare to the entire child care workforce? 3. To what extent does the receipt of a scholarship predict an increase in providers' professional development while controlling for provider characteristics? 4. To what extent does the receipt of a scholarship predict an increase in provider's professional development for minorities or for those whose primary language is not English? Copyright 2014 by Oregon State University. All rights reserved.